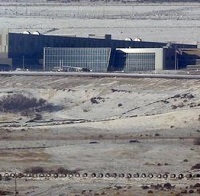 Shown here is the National Security Agency Spy Facility in Bluffdale, Utah. SAN FRANCISCO (Reuters) - By Joseph Menn -- The U.S. National Security Agency has figured out how to hide spying software deep within hard drives made by Western Digital, Seagate, Toshiba and other top manufacturers, giving the agency the means to eavesdrop on the majority of the world's computers, according to cyber researchers and former operatives. Kaspersky published the technical details of its research on Monday, which should help infected institutions detect the spying programs, some of which trace back as far as 2001. The disclosure could further hurt the NSA's surveillance abilities, already damaged by massive leaks by former contractor Edward Snowden. Snowden's revelations have hurt the United States' relations with some allies and slowed the sales of U.S. technology products abroad. Peter Swire, one of five members of U.S. President Barack Obama's Review Group on Intelligence and Communications Technology, said the Kaspersky report showed that it is essential for the country to consider the possible impact on trade and diplomatic relations before deciding to use its knowledge of software flaws for intelligence gathering. "There can be serious negative effects on other U.S. interests," Swire said. Though the leaders of the still-active espionage campaign could have taken control of thousands of PCs, giving them the ability to steal files or eavesdrop on anything they wanted, the spies were selective and only established full remote control over machines belonging to the most desirable foreign targets, according to Raiu. He said Kaspersky found only a few especially high-value computers with the hard-drive infections. "There is zero chance that someone could rewrite the [hard drive] operating system using public information," Raiu said. It is not clear how the NSA may have obtained the hard drives' source code. Western Digital spokesman Steve Shattuck said the company "has not provided its source code to government agencies." The other hard drive makers would not say if they had shared their source code with the NSA. Seagate spokesman Clive Over said it has "secure measures to prevent tampering or reverse engineering of its firmware and other technologies." Micron spokesman Daniel Francisco said the company took the security of its products seriously and "we are not aware of any instances of foreign code." "They don't admit it, but they do say, 'We're going to do an evaluation, we need the source code,'" said Vincent Liu, a partner at security consulting firm Bishop Fox and former NSA analyst. "It's usually the NSA doing the evaluation, and it's a pretty small leap to say they're going to keep that source code." Kaspersky called the authors of the spying program "the Equation group," named after their embrace of complex encryption formulas.